I guess my love for baking and sweet treats has made an impression on my family. I was greeted with a lovely box of mini-cupcakes from local cake boutique, sugarbliss, yesterday in celebration of my birthday. While most might dig right in, I spent more time taking photos and admiring the cupcakes than actually eating them. The reviews from my co-workers and friends have been great though and I’m looking forward to trying out the various flavors in the next few days. Since cupcakes are oh-so-trendy lately (insert plug for my new favorite show: Cupcake Wars here), I thought they deserved their own special post. 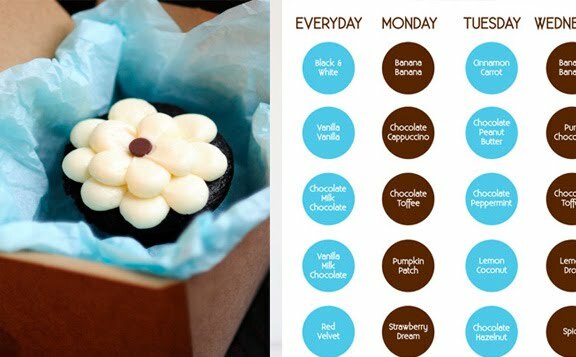 With flavors varying depending on the day of the week, Sugarbliss includes a “cupcake key” in each package along with a great brochure to help you decode each cupcake before you dig in. What a fun idea! !